I love sushi, unicorns, pusheen and playing with friends! I will do F4F if you ask! 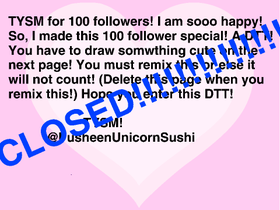 Thank you to @1Sushi-aesthetics for being my 99th follower and to @cs307287 for being my 100th follower YAY!!!!!!!! I will not be very active that much because of how busy I am. Thank you to @1_Sushi for my profile picture! DTT For 100 followers! CLOSED!!!!!!! Follow if you like Pusheen! A Studio For My Scratch Friends! Wow! Thxs for over 200 follows!! !